Suddenly, and without explanation, my Adobe CC Photoshop install started giving me really small, really tiny, menus. Shrunken menus even. Top bar menu, tool menus, palettes, everything menu related, is now reduced in size to almost unusability. Even the intro screen is tiny. The images are fine, and oddly enough, when clicking on a menu item the drop-down list is normal sized but everything else is shrunk. And my new progressive lens (yes, I’m that old) don’t like it one bit. How did this happen? What feature did I accidentally turn on? Being a new windows user, with a new computer (Surface Pro 4), with a new version of Photoshop, I had a lot of options out there to search for the culprit. The one thing I knew, I didn’t do this intentionally. So here’s how I started the troubleshooting search. 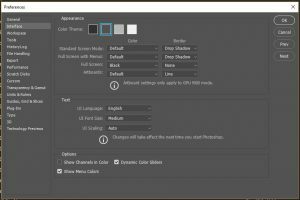 So how did I fix a sudden switch to small photoshop menus? A lot of searching. Some head scratching. And trying different terms in my searches. In Photoshop CC 2014, you have the option to activate experimental components—features that haven’t been officially incorporated into Photoshop—with the caveat that these features might not be fully production-ready yet. Ok, so far so good. One of the experimental features lets you scale Photoshop’s interface @200% to accommodate a high-density display (Note: it’s available—and necessary—only on Windows using hiDPI display, it has been on Mac Retina displays since CS6). The Surface Pro 4 falls into that category. Taadaa! I’m on the right track – I hope. A quick search and I was able to access experimental features in Photoshop, just choose Edit > Preferences > Experimental Features. then turn off the scaling feature. But I have CC 2015 and that preference option wasn’t there. What the heck? In the Text section, find the UI Scaling drop-down box. Change if from “100%” to “200%”. Yeah! I had no idea that there were experimental features to turn on, and I suggest that if you actually work with Photoshop and depend on it for a living, never turn on experimental features. I’m presuming that in the last update to Creative Cloud Adobe turned the HiDPI preference on automatically. Which, I’m going to say, is phenomenally stupid. Options should never be turned on by default, especially experimental ones. Rather explain as to why a user should turn it on, how, and how to turn it off, if necessary. Adobe turning on this “feature” in the update it cost me two hours of work time. I’m only a tiny bit bitter about that. I guess it’s more that Photoshop started taking advantage of the better screen HiDPI than actually turning on that feature. It was still set to 100%, the default, but that default took on new meaning with the advantages of HiDPI. All good now, back to normal and a little bit better and smarter for it. Anyone else ever hit this problem? Hope this helps you out. Hey, that’s a lot of exclamation marks, you must really man it. 🙂 Glad my healed pain helped someone else. Thank you for this! I was pulling what little hair I have left out over this problem.